This morning I was browsing Instagram (as I am known to do) when I came across this photo of a Vegan Quinoa and Coconut Pudding. I hadn’t had breakfast and it looked damn good so I started looking in vain for the recipe. Not one to be deterred by the lack of instructions, I headed to the kitchen and got busy with my craft. I came up with the following as a start. Of course, I washed the quinoa first and then set the ingredients on the stove and brought them to a low boil. I turned down the heat and covered the pot with a lid. After about 15 minutes I checked on things. Despite the fact that most of the liquid was absorbed, the quinoa didn’t look like it was done — the hulls were still completely intact. I figured that there must have been something about the milk/coconut milk mixture that prevented this — I hypothesized that it was the fat content of the coconut milk but that’s just a guess. So I added 1/4 cup of water to the pot and let it simmer for another 10 minutes. When I checked, the quinoa was done. 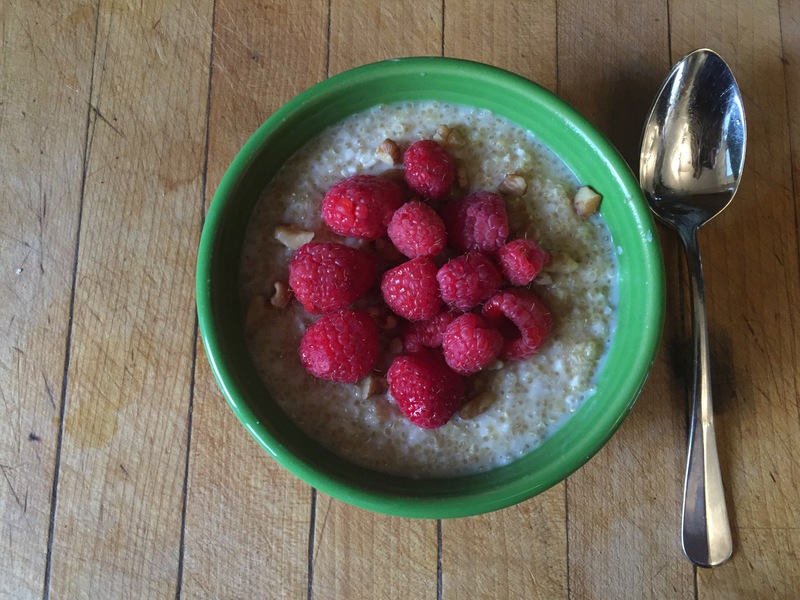 I garnished the porridge with chopped walnuts, honey and raspberries. It turned out really good and packed a full 15 grams of protein to boot!